JPL, managed by the California Institute of Technology, built the rover and manages the project for NASA’s Science Mission Directorate in Washington. 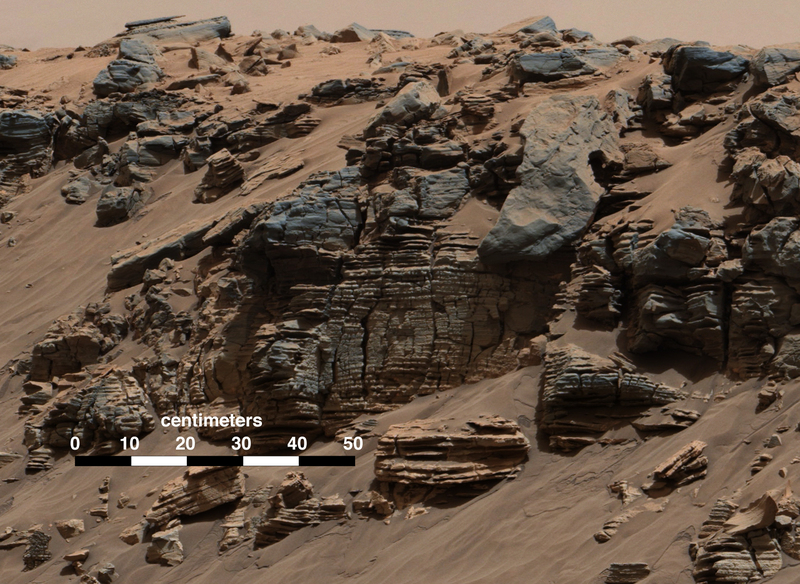 This evenly layered rock photographed by the Mast Camera (Mastcam) on NASA’s Curiosity Mars Rover shows a pattern typical of a lake-floor sedimentary deposit not far from where flowing water entered a lake. The scene combines multiple frames taken with Mastcam’s right-eye camera on Aug. 7, 2014, during the 712th Martian day, or sol, of Curiosity’s work on Mars. It shows an outcrop at the edge of “Hidden Valley,” seen from the valley floor. This view spans about 5 feet (1.5 meters) across in the foreground. The color has been approximately white-balanced to resemble how the scene would appear under daytime lighting conditions on Earth. Figure A is a version with a superimposed scale bar of 50 centimeters (about 20 inches). This evenly layered rock photographed by the Mast Camera (Mastcam) on NASA’s Curiosity Mars Rover on Aug. 7, 2014, shows a pattern typical of a lake-floor sedimentary deposit not far from where flowing water entered a lake.